Far simpler to train in the use of a crossbow than a bow, many generals arm their peasants with crossbows to provide mass missile fire. 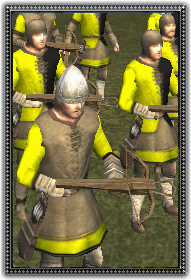 Peasant Crossbowmen are equipped with a crossbow and have a simple knife for a sidearm. Lucky peasants are armoured in light mail, most peasants though are not lucky and are unarmoured.